If you have only ever seen the rather stern Victorian-looking red-brick exterior of the church, then the elegance and simplicity of the interior will come as a complete – and delightful – surprise. The church has probably the most beautiful interior in the south of England, its white walls and barrel-arch ceiling serving as the perfect foil for the marble of the high altar, with its eighteenth century reredos (see above) painted by Floyce, and for the soaring pipes and baroque casing of Handel’s famous organ. The nave is dominated by two rows of seven Ionic columns, which encase the 14 oak trees that support the roof (don’t ask – just come and see). Holy Trinity was consecrated in September 1696 (as the Church of the Holy and Undivided Trinity) by the Bishop of Winchester Peter Mews – who gave the oak trees to the church. In the eighteenth century, the west facade was enhanced and the east end extended to incorporate a semi-dome supported on pilasters with intricate Roman detailing. The next major change came in the late nineteenth century when architect Sir Arthur Blomfield designed a detached brick campanile – which became a landmark for generations of naval captains – and made signficant alterations to the interior which, as Nikolaus Pevsner remarked, turned it into a “simplified version of a Lombard basilica”. The church’s greatest treasure is the Handel organ. From 1718-1720, Handel was director of music to James Brydges, Duke of Chandos, and commissioned the building of this organ for the Duke’s new house on the Canons estate at Edgware, Middlesex. 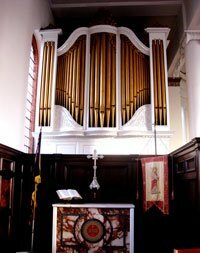 The builders, Abraham Jordan and his son, were the first to enclose the pipes of the swell organ in a wooden box with a sliding shutter in its front which could be opened and closed by means of a pedal, regulating the volume of sound produced. Canons was demolished in 1744 after the death of the Duke and its materials auctioned. Holy Trinity paid £117 for the organ. It was originally installed in the west gallery and moved to its present position in 1867. Although it has since undergone extensive restoration, four of the stops on the great organ and five on the choir organ are original Jordan work. In 2011/12 Andrew Cooper completely restored our Handel Organ with the help of our fund raising and the Heritage Lottery Fund preserving the fine instrument for future generations. Holy Trinity has a reputation for long service and dedication to the parish by its servants: since the church’s inauguration in 1696 there have only been 16 priests, beginning in 1701 with Rev William Ogilvie. The longest-serving minister was the flamboyant Rev Richard Bingham who, in 1789, succeeded his father as priest and went on to hold the post for 66 years. They were years of some notoriety – Bingham, who was a wealthy man and a builder (he developed much of the Newtown area of Gosport) – was known for his regular court appearances. It was Bingham who built the magnificent five-storey vicarage on Trinity Green, only to have it immediately commandeered by the Board of Ordnance as a residence for the Commandant of Royal Engineers. A legal battle ensured that it would be returned to the church on Bingham’s death. In 1858 Rev William Skipsey-Saunders became the new incumbent and moved Holy Trinity away from its ‘low church’ tradition to embrace the ethos of the Oxford Movement, with an emphasis on ritual and ceremony – something to which Holy Trinity continues to subscribe today. The church’s Anglo-Catholicism was further enhanced under the ministry of Rev Henry Woolsey, who only served for 14 years (1912-1926) but who introduced daily services of matins, communion and evensong; a set time for hearing confessions, and the use of incense. 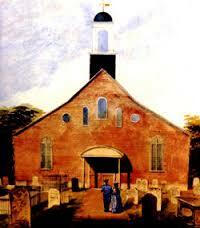 He also used the monthly parish magazine as a means of spreading catholic teaching throughout the parish. Many people who have lived in Gosport all their lives have memories of Canon Cyril Barclay who was vicar of Holy Trinity for 32 years from 1935 – and thus saw the church through some traumatic years, including the wartime bombings of the town and the subsequent redevelopment of Trinity Green. He was succeeded in 1968 by Father John Capper who was another staunch Anglo-Catholic and a graduate of the College of the Resurrection at Mirfield. He was therefore well suited to fit into the style of worship practised at Holy Trinity. John Capper served for 33 years until his death in 2002, after which the future of the church was in doubt because of the dwindling size of its congregation. This trend was reversed with the appointment of Father Ian Booth, who shared John Capper’s ‘high church’ ethos, increased the congregation and introduced much-needed changes (such as celebrating the Eucharist in the round). The church is now very much alive and vibrant and Father Andy hopes to build on all that Father Ian achieved, and to try and honour the memory of all the priests and people that have gone before.